DOT Physical - Official form regarding current prescriptions? She said Wellbutrin is OK as long as my prescribing physician signs off on it. Rick, I owe you sir! I gave it a shot and called the third party company that does Prime's DOT physicals. The woman that answered was more than happy to look up medications and let me know if they're allowed with my doctor's release or if they're not allowed at all. Phentermine is not allowed at all. I called my recruiter and we pushed my start date out 30 days. I was all set to start this Monday but I'm glad you said something because I would've definitely been sent home unemployed. My boss was happy to find out she gets to keep me for 30 more days. lol I would think that recruiters would ask about medications since most don't know about DOT physicals. Oh well, my recruiter has been great though. I'm going to be taking my DOT physical Monday and I currently take 2 prescriptions. 1) Wellbutrin for mild depression and 2) Phentermine for appetite suppression. I have an appointment with my doctor who prescribes these meds and was wondering if there's a form out there I can print to take with me so he can state taking these meds won't interfere with my ability to operate a CMV. Does anyone know where I can find this form (if it exists)? If not, can someone tell me exactly what the doctor should write? I have a mask that just covers my nose because I can't deal with my mouth AND nose being covered...and yes, it takes a while to get used to. I do sleep better though. My blood pressure has stabilized, and I don't wake up every morning with a splitting headache like I used to. Same here. I was initially given a full face mask and kept throwing it on the floor in the middle of the night. I talked to the sleep study center and they told me to try a mask like Kat mentioned. That was 4 years ago and I love it. I tried the nasal pillow masks that have soft rubber nasal tips that fit just inside your nostrils. I couldn't get it to stop leaking air so I'm back to the over-the-nose mask. Once you get used to it and feel the benefits of getting good sleep, you'll never think twice about using it every time you sleep. Maybe I need to wear those glasses that help old farts see close-up. Here at prime, the physical was very basic. Blood pressure, heart rate, vision, etc. Regarding the heart rate check, do they check it before the agility test, after it, or both? Trucking as a way to help pay for college? A couple of things I'd like to mention are 1) Prime's CDL training costs $155 out of your pocket and as long as you complete 1 year, you don't pay a dime of that back. 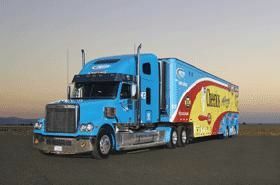 Wil-Trans and Jim Palmer also have similar CDL training programs. I don't know of any other trucking companies that offer such a great deal for training but the admins have made a list here on TT. 2) Have you thought about maintaining your career as a truck driver while taking online courses? It's something I'm considering but I'm not a trucker just yet so I don't know how well that would work out. I know with a lot of online courses you log in and do your assignments, listen to recorded video lessons, etc. whenever you have time, whether it's 8am or 11pm. Anyway, just wanted to throw that out there. Good luck! What does Prime check before approving you for orientation? I start Prime CDL training on 01/09. I disclosed all 3 criminal matters on my application. The newest one being from 1999. The application you fill out electronically on Prime's website asks about convictions, pleaded guilty, pleaded no contest. It mentions nothing about arrests only. Anyway, that doesn't pertain to me because I did go to court and either pleaded guilty or was convicted on all 3 charges. One of the charges is horrible back from 1995 but I'm not going into details. My recruiter says that it didn't show up on my background check but since I disclosed it on my application, he has to talk to me about it. I explained the entire situation in detail. When I looked at the .pdf document of my online application, my explanation about this situation was over 4 pages long. My recruiter said that I definitely got a raw deal because I couldn't afford a defense attorney and my public defender was overburdened with over 100 other criminal cases. The recruiter said that none of the 3 criminal matters will be a problem. Is there any chance at all that I show up in Springfield and the safety department disagrees with my recruiter and sends me home? I'm an employee of AT&T. I worked for DIRECTV in the advanced tech support department before AT&T bought us in July 2015. I still work in the same department but for AT&T now. I follow this website because I've been researching many companies to find the one I want to train me. After reading Rainy's and many others who have posted, I start training with Prime on 01/09/2017. I can give you the scoop on Cricket since they were acquired by AT&T and now use the same network. Personally, I would choose Cricket's unlimited everything plan over anything else from any other carrier. You get unlimited talk, text and unlimited un-throttled data on AT&Ts vast network. I've been using AT&T since they acquired DIRECTV because of the 50% discount I get as an employee. I couldn't be happier. I live in Oklahoma and have traveled in many rural areas of the state while listening to Pandora without a song pausing even once. Prior to AT&T, my wife & I used Boost for over 10 years. We only paid $40/month per phone but only got 2GB of data on each but the phones were 3G only. Boost uses the same network as Sprint and Sprint's coverage is inferior to both AT&T's and Verizon's. AT&T's unlimited everything plan has 2 caveats, 1) You have to subscribe to DIRECTV to get the unlimited data plan and 2) After 22GBs of data each month they "can" throttle your speed. I've spoken with many customers who have told me they use over 100GBs of data/month without being throttled. I assume it depends on the congestion in the area you're in. My service hasn't been throttled either but I only went over 22GBs once. AT&T, Cricket and every other carrier (as far as I know) will deactivate your mobile device's ability to act as a wifi hotspot when you have unlimited data. I have found a workaround that works at least for AT&T/Cricket. If you download the app FoxFi with pdanet+, you can use your mobile device with unlimited data to "tether" to other devices such as laptops, tablets & desktops (although I don't think many truckers use desktops in their rigs). It's not a hotspot per se but you can either tether to any device using a USB cable (fastest internet speed) or through Bluetooth. Connecting my desktop at home to my tethered Samsung Galaxy S7 phone via USB I get about 10 mbps (megabits per second) download speed and around 5 mbps upload. Using Bluetooth, I get around 2 mbps download and 1 mbps upload. Anyway, just wanted to throw in my 2 cents since I know a little more than most about AT&T and Cricket cellular. Stay safe out there drivers and thank you TT for being far superior to that other trucker forum. Congrats! Tell us all about your truck! You've accomplished a lot. Keep it up! Thanks for all the feedback everyone. With the risk of turning my phone into a paperweight, I think I'll go with a wifi hotspot device and pay for the service that way. I didn't realize everything related to cell service is tax deductible. Thanks again for all the help! AT&T and their subsidiary Cricket now offer unlimited data plans but turn off your phone's ability to tether. I'm wondering if anyone has found a way to get around this. I can't think of many (if any) professions that use cellular data like truckers. Thanks for any input. I plan to keep my black card membership at Planet Fitness while I drive OTR. The few locations here in Tulsa have adequate parking for a TT. In fact, I often see a Prime truck/trailer at the location closest to my home. You might also want to consider resistance bands. I saw a great set on ****'s Sporting Goods website for $60 with great reviews. Up to 140 pounds resistance which is plenty for me. Has anyone run into this issue? Thanks for replying. I also tried a couple other companies, and it turns out that these companies have a hiring policy for Wyoming, because there's not really any freight in Wyoming. I did get ahold of Jim Palmer, and things seem too be looking good that I might be able to get in their training program. PRIME, inc. - Getting started on yet another new career! I wonder what happened??? I was enjoying the writing and looking forward to reading about your story with Prime. I hope all is well with you and your family. Merry Christmas! !